A great deal has been written on the history of the celebrated Bakewell Pudding, much of it I am afraid rather inaccurate nonsense. One shop in Bakewell which makes a version of the pudding from a 'secret recipe' believes it was invented by accident in 1860 in a local inn called the White Horse. They claim it came about through a misunderstanding between the landlord Mrs Graves and her cook, who jumbled up the ingredients for a jam tart incorrectly. This popular legend ignores the fact that recipes for the dish had already been published in the 1830s and that the White Horse had actually been demolished in 1803. There was never a landlady called Mrs Graves at the White Horse, although a family called Greaves did run the Rutland Arms for much of the nineteenth century, the hotel which replaced the old inn. Such though is the nature of commercial chauvinism that the myth is signed off - 'As told by the people who know...' This shop does know how to make rather nice Bakewell puddings, but whoever wrote their web page is no historian. Try googling 'the history of Bakewell pudding' and you will find it is the top hit on the subject. Such is the power of the internet as a vehicle for spreading jabberwocky. Much confusion surrounds the emergence of recipes for this pudding in nineteenth century printed cookery books. The deep unregulated reaches of the internet are not the only places where you will find mistaken information. Even respectable referenced sources can be at fault. Alan Davidson, in the Oxford Companion to Food (OUP 1999) tells us the earliest published recipe was in Meg Dod's book The Cook and Housewife's Manual (Edinburgh: 1826). It seems strange that a regional dish from Derbyshire would be first published in a Scottish cookery book, but this is an error, as the 1826 first edition of Dod's book does not include a recipe at all. However, a conversation I had with Alan Davidson's widow Jane a few years before her death, revealed that her extraordinary husband owned a copy of the 1862 revised eleventh edition of Dod's book to which the publishers had added extra recipes, including this one for Bakewell Pudding. An identical recipe was issued the same year in Philadelphia by the cookery writer Frances Harriet Green in The Housekeeper's Book. But surely, the earliest recipes for this iconic English pudding could not have been published first on the other side of the Atlantic? No. There must have been an earlier English source. Well, last year Plumcake discovered the origin of these two recipes in an anonymous English publication called The Magazine of Domestic Economy, issued in London a year earlier in 1836. The two American magazines had copied it word for word. In the previous month's number the English magazine had promised to its readers 'Next month we shall give the far-famed Bakewell pudding.'' Its reputation was just about to become international. Other local legends claim that the pudding first appeared in the kitchen of the Rutland Arms in the 1820s, a chronology that makes slightly more sense than the nonsense quoted at the beginning of this post. Plumcake also found another interesting recipe in a 1948 recipe collection published by the National Federation of Women's Institutes called Traditional Fare of England and Wales. 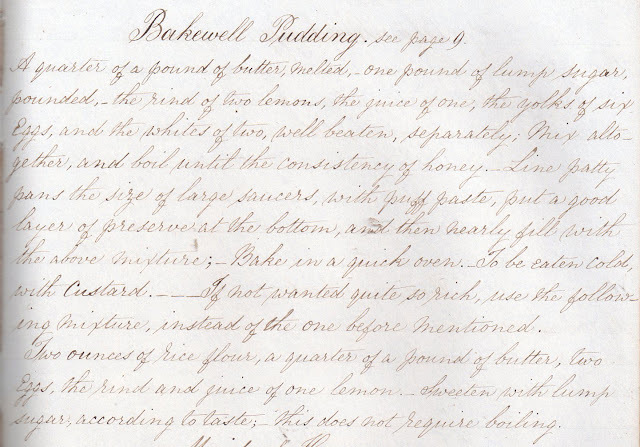 This little book contains three recipes for Bakewell Pudding, including one with the comment, 'A Mr. Stephen Blair gave £5 for this recipe at the hotel at Bakewell about 1835.' If this was the case, the recipe as written in the WI book has been adapted into modern form. It certainly would not have been written out as is below in 1835. Castor sugar would not have been named as an ingredient at this time. 10 yolks and 2 whites of eggs. Flavour with either bitter almonds, lemon, nutmeg or cinnamon. (These ingredients to be well mixed, but not beaten up). Bake in a moderate oven. When cold grate white sugar over pudding. 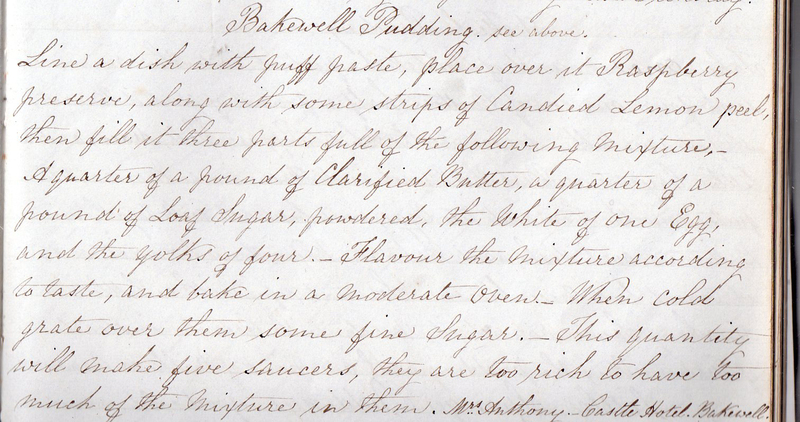 A Mr. Stephen Blair gave £5 for this recipe at the hotel at Bakewell about 1835. From Traditional Fare of England and Wales. (London: 1948). Unfortunately the WI book does not give a primary source for this most interesting recipe. In all the stories about Bakewell Pudding, the Rutland Arms Hotel or the inn that preceded it, the aforementioned White Horse are usually described as the birthplace of the dish. So most would assume that the hotel in Bakewell where Mr Blair bought his recipe was probably one of these. However, I own a manuscript receipt book dated 1835 which has three recipes, one of which names another local inn that seems to feature in the history of the pudding. I am publishing all three of these recipes here. 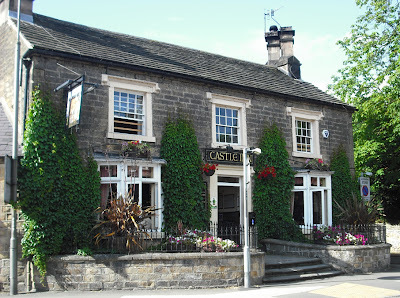 The first recipe was given to the author of the manuscript by a Mrs Anthony of the Castle Hotel in Bakewell. In some ways it is very similar to the Stephen Blair recipe above, except the ingredients have been halved, though there are slightly less egg yolks in the mix. Here it is. Mrs Antbony's recipe seems to be the earliest known with a Bakewell provenance. 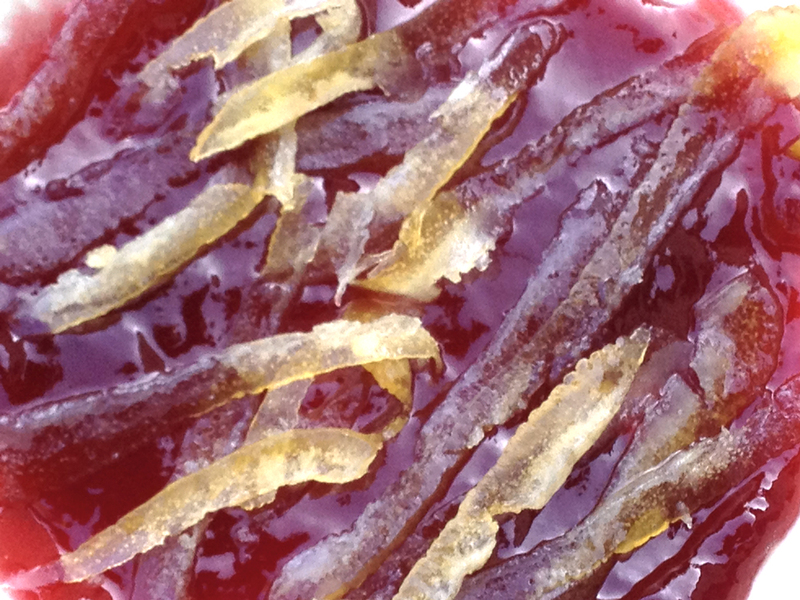 She instructs us to lay strips of candied lemon over a layer of raspberry preserve. Mrs Anthony's finished pudding. On a base of homemade puff paste, homemade raspberry preserve and my own preserved lemon peel this pudding is truly delicious, though incredibly rich. It is in a different league to the commercially made ones sold in Bakewell. The 1835 edition of Pigot's Directory for Derbyshire tells us that the Castle was run at this time by a Mr Richard Anthony. Obviously Mrs Anthony was his wife. Her christian name was Hannah. The hotel, actually an inn, is still extant and remains a popular local watering hole. Read the page below from the Directory and you will also notice The Rutland Arms, Market Place - proprietor Mr Greaves (the son of the famous Mrs Ann Greaves who is usually credited with first marketing the pudding). And also an inn called the White Horse on Gilliver Hill, a place name which no longer exists in the town. Though this is not the famous White Horse in Market Place which was replaced by the Rutland Arms. 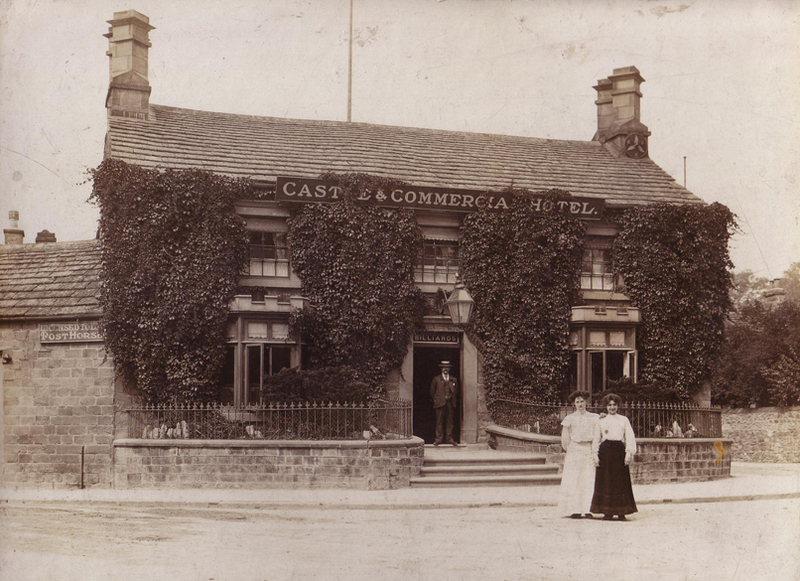 There were at one time two establishments called the White Horse in Bakewell. However, as can be seen from this document, the most important hotel of the town in Market Place in 1835 is trading as the Rutland Arms, not as the White Horse. For more information on Mrs Greaves and the local history of the pudding, an article written by Paul Hudson, Mrs Greaves' great-great-great-grandson is well worth reading. There is a link at the end of this post. I am indebted to Mr Hudson for generously sharing his considerable knowledge with me. The Castle in the early twentieth century. Standing outside are Will, Mary and Katie Hudson. The Hudson family ran the hotel from 1889 to 1915. Richard and Hannah Anthony had managed it in the first half of the nineteenth century. Photo courtesy of Paul Hudson. 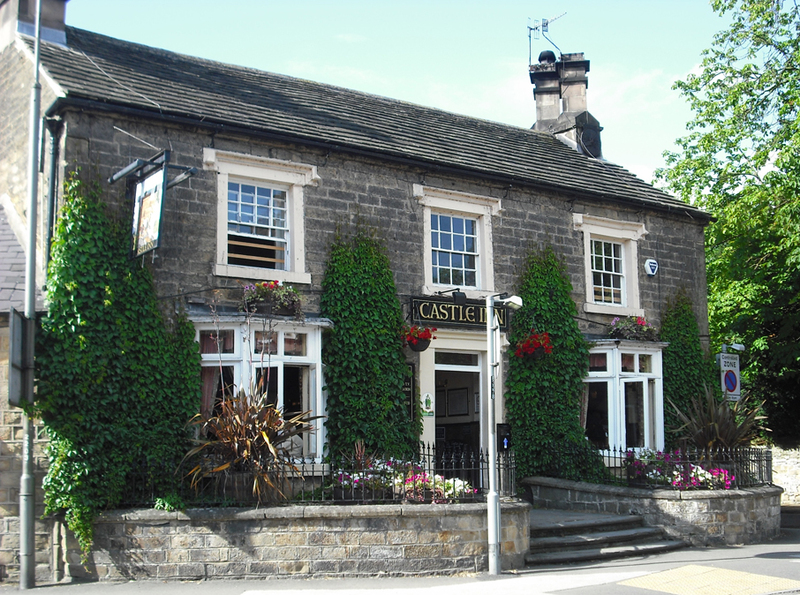 The manuscript in which the Castle Inn recipe is included was started in 1835, but this does not mean that the recipe dates from that year, as the book was an ongoing project which may not have been completed for some years. It seems to have been written by a Mrs Norton. But what is fascinating is that Mrs Anthony was living at the Castle Hotel in 1835 and probably baking her Bakewell puddings for her customers. She may also have been selling the recipe to those who were willing to part with the odd fiver. Here are the two other recipes. They are quite different. I have been unable to identify Mrs Pickslay, the authoress of the first one. Mrs Pickslay's recipe requires a three layered stratum of different preserves, giving the baker freedom of choice. I used quince jam, preserved citron and preserved plums. Bakewell puddings have sometimes unkindly been compared to cow pats. Mrs Pickslay's is the closest I have ever seen to one. Unlike Mrs Anthony's the custard contains almonds and lemon. I used both the grated rind and juice. Verdict - truly delicious, but again so rich, that only a small helping is required. 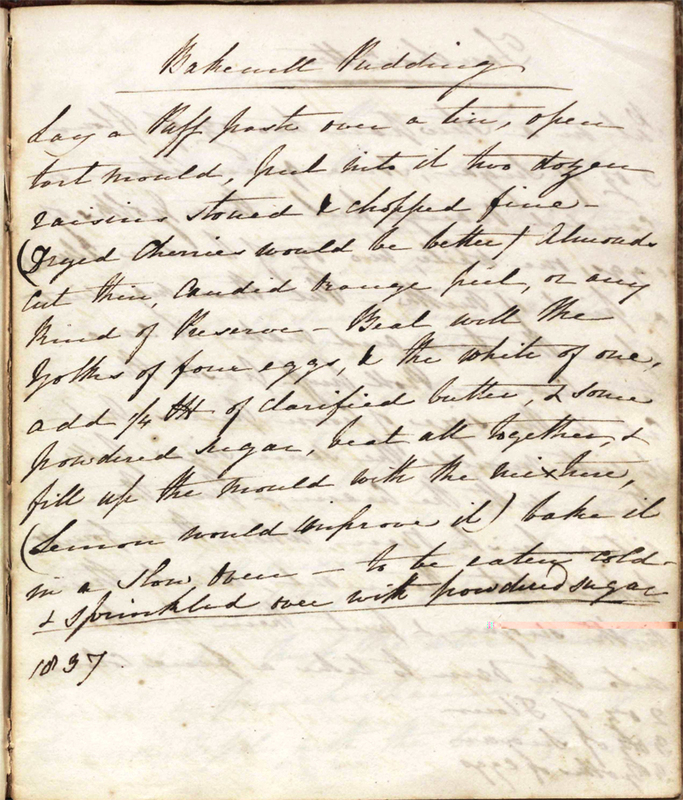 A manuscript recently acquired by Derbyshire Record Office contains a recipe which is very usefully dated 1837. 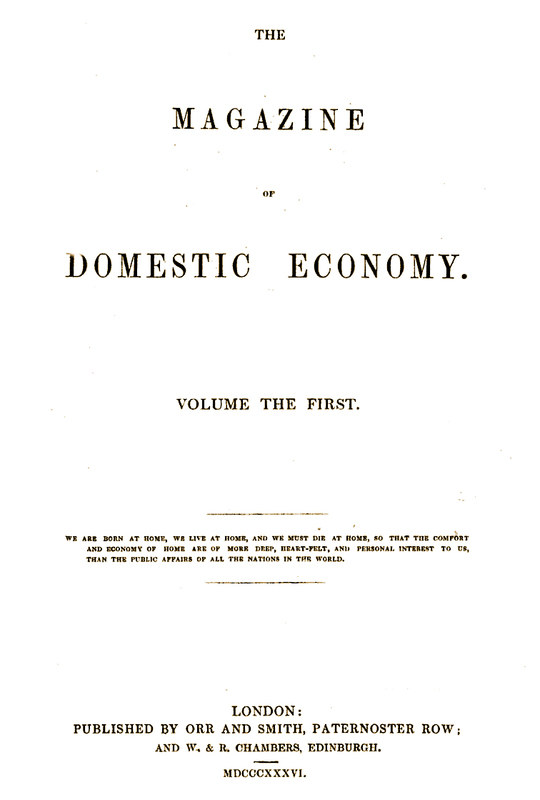 It was compiled by Clara Palmer-Morewood of Alfreton Hall, Alfreton, Derbyshire. As you can see it is quite different to the recipe published in the previous year in The Magazine of Domestic Economy. Until someone locates the original source of the recipe said to have been purchased by Mr Blair in 1835, the magazine's recipe still remains the earliest to go into print. Carolyn and Richard Young at The Original Farmers Market Shop, Bakewell have been making Bakewell puddings from Clara Palmer-Morewood's recipe. Photo. Courtesy Carolyn and Richard Young. What is fascinating is that all these 1830s recipes for Bakewell Pudding are already quite different in character, making the whole question of authenticity rather elastic. At least it isn't claimed that it was invented by Escoffier or Mrs Beeton, which is rather common. The early recipes are really interesting and so is the fact that a dish can be described as "far-famed", but is not well documented. Like many of these dishes it seems to explode onto the scene, then settle into the niche as a tradional well-known dish. What do you think the relationship is with Bakewell Tart? Given the variation in the early recipes (Eliza Acton's 1845 recipe doesn't seem to use pastry for instance), do you think they might have the same origin? 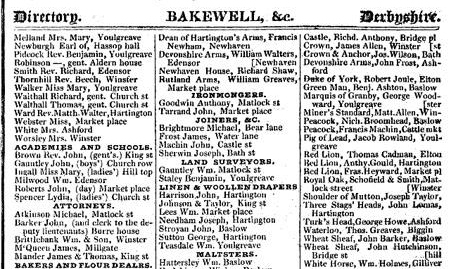 In the Sherbourne Mercury; Tues. 26th June 1866, a bill of fare given at the Three Cloughs Hotel lists "Tartes a la Bakewell", so the Bakewell Tart seems to be made a little earlier then is usually claimed. 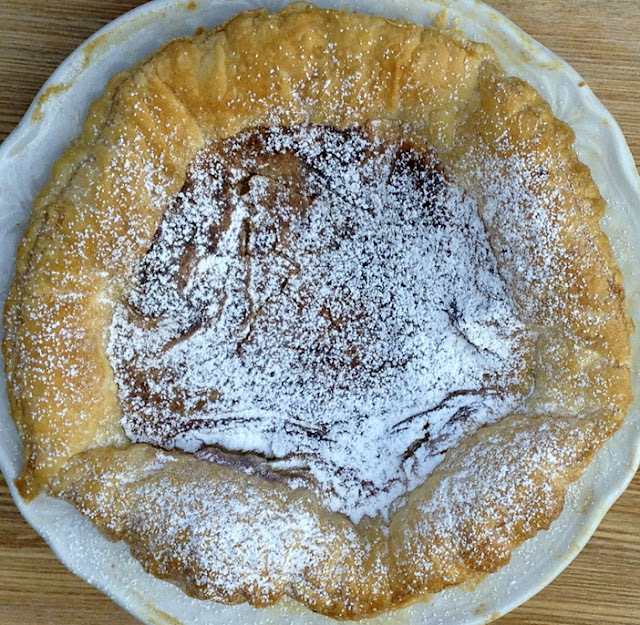 There is so much to say about this issue that I will deal with the relationship between Bakewell Pudding and Bakewell Tart in another posting dedicated to the subject. You are right, there was a minor flurry of recipes for the pudding emerging from the mid-1830s onward. According to the local legends propagated by the families who developed a commercial interest in the pudding, the 'traditionilisation' of what was going to become a lucrative product appears to have got underway by the second half of the nineteenth century, probably due to the opportunities arising from increased tourism in the town. This phenomenon, which tells us more about Victorian commercial culture, than it does about real traditional foods, was common throughout Britain at this period. More anon. Was about to post similar question to last commentator, looking forward to the post comparing the two. Ivan - I have a manuscript cookery book largely based around Cumbria/Lancashire. 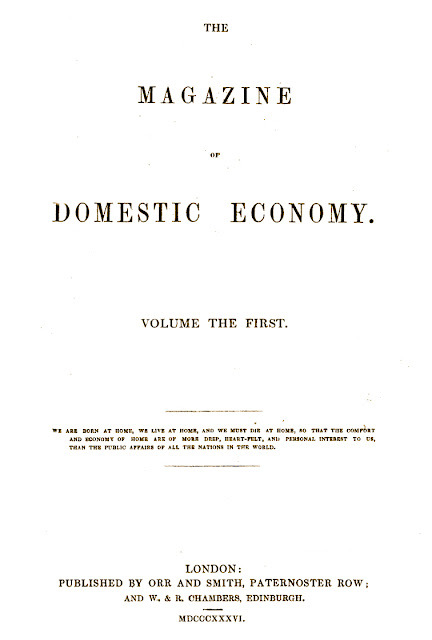 The earlist rescipes are from 1836. 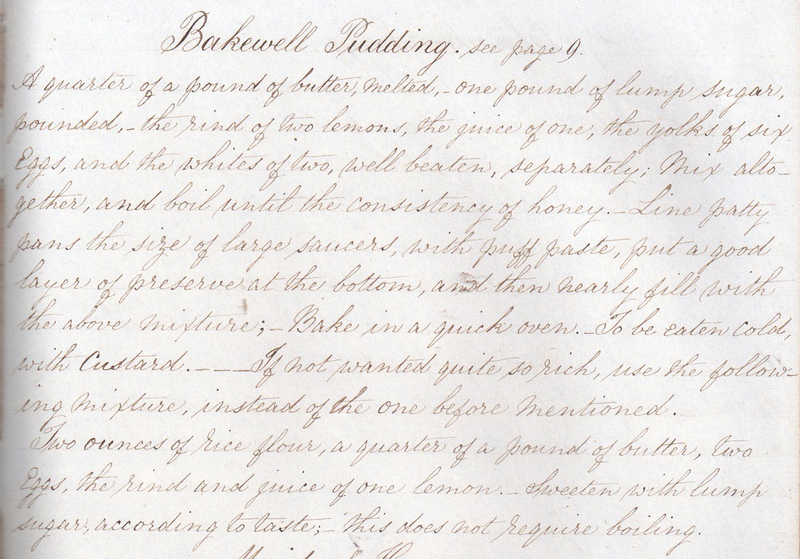 There is and undated a Bakewell Pudding recipe (from Leyland) in the same hand as the oldest recipes. 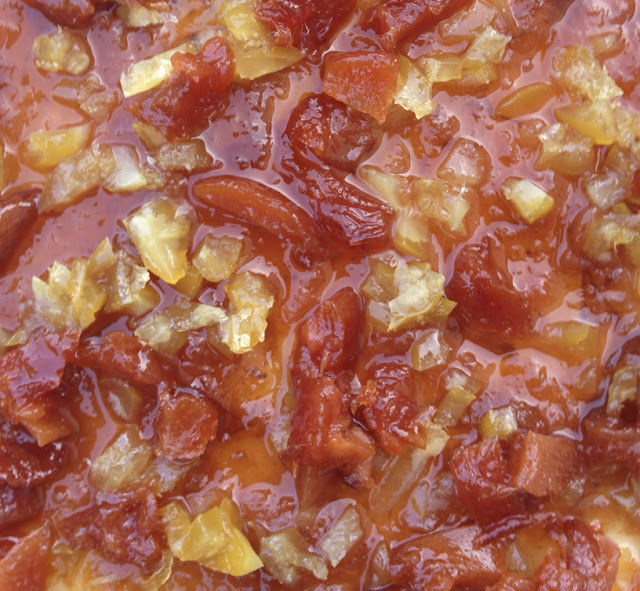 It says to spread the paste "with a few nice preserves and some candied lemon and citron chopped very fine". This is then covered with a mixture of butter (1/2 lb), powdered sugar (1/2 lb), 10 egg yolks and the whites of two. This is made into a custard and flavoured with bitter almonds. Paul Hudson, who is the great-great-great-grandson of Mrs Ann Greaves, who ran the Rutland Arms in Bakewell between 1804 and 1857 has sent me the following message. I recently read your Food History Jottings page about the History of the Bakewell Pudding. 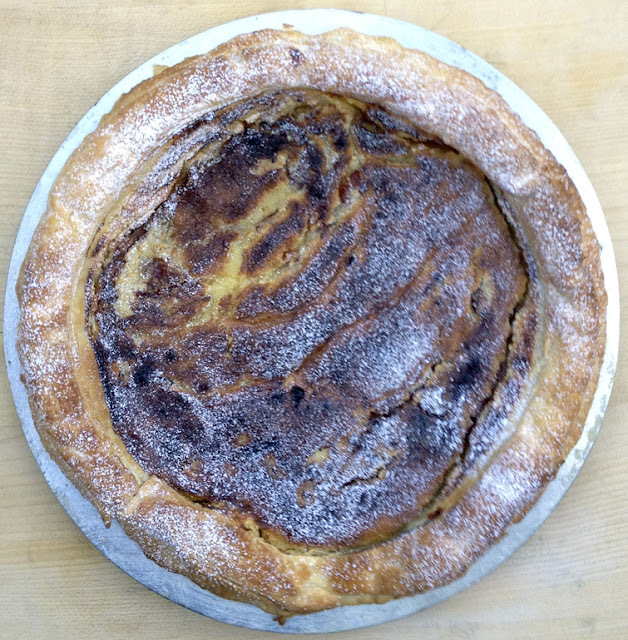 You are totally correct about the abysmal content of the various histories of the Bakewell Pudding shown online but recently I have been attempting to put it right. I am the great-great-great-grandson of Mrs Ann Greaves, who from 1804 to 1857 ran the Rutland Arms Hotel in Bakewell with her two husbands, James Hudson (1804-1805) and William Greaves (1805-1831). When she was widowed in 1831 she ran it on her own and for a short time with her son, Billy Greaves, until she retired in 1857 and went to live in Manchester with her daughter, Ann Bradley. I have written a book and 2 booklets about the history of my family, Bakewell and the Rutland Arms Hotel and the most recent, "Mrs Ann Greaves of the Rutland Arms and the Bakewell Pudding", was published earlier this year. What annoys me about the online version of the History of the Bakewell Pudding shown on the Bakewell Pudding Shop website is that it is so inaccurate yet all the facts and figures shown in my books can easily be verified in local public records, either Parish Registers, census records or the registry of births, deaths and marriages. So it embarrases me when the Bakewell Pudding Shop declares that the first pudding was made by a Mrs Graves at The White Horse Inn in 1860 when it is all untrue. Please feel free to use any of the information or images contained in the extract as they all belong to me. Mrs Greaves was in charge at the Rutland Arms for 53 years and there were probably several "Bakewell Pudding" recipes in her own personal Recipe Book during that time. She is known to have been very generous with sharing her recipes with friends and family. However, it was not until one day some time between 1851 and 1857 that she asked one of her waitresses, a girl from Bonsall called Ann Wheeldon, to assist her in the kitchens of the Rutland Arms in the making of a Bakewell Pudding. It was probably something similar to the one found in the Clara Palmer Morewood recipe book recently purchased by the Derbyshire Record Office. However the waitress, Ann Wheeldon, made a mistake with the recipe, probably by leaving out the raisins or the cherries, Mrs Greaves made a note of the ingredients of the new Bakewell Pudding and the rest is history! Mrs Palmer-Morwood lived at Alfreton Hall and Mrs Ann Greaves (formerly maiden name Summers) was born two miles away in Swanwick and the two ladies could easily have been best friends since childhood and exchanged recipes since then. 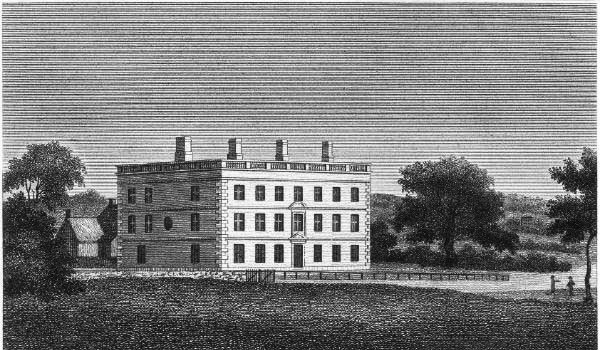 The Alfreton Hall recipe bears a few similarities to the original recipe (which is traditionally passed to new wives in the Hudson family on marriage) but amongst others the most glaring discrepancy is the use of raisins in the former! It sounds ghastly combined with the rest of the recipe and it looks as if the waitress, Ann Wheeldon, did us all a favour by leaving them out in her haste which resulted in her and Ann Greaves creating the delicious Bakewell Pudding as we know it and which has made Bakewell famous the world over. Ivan - do you have an opinion on the Bakewell pudding as a development of the Transparent Pudding? 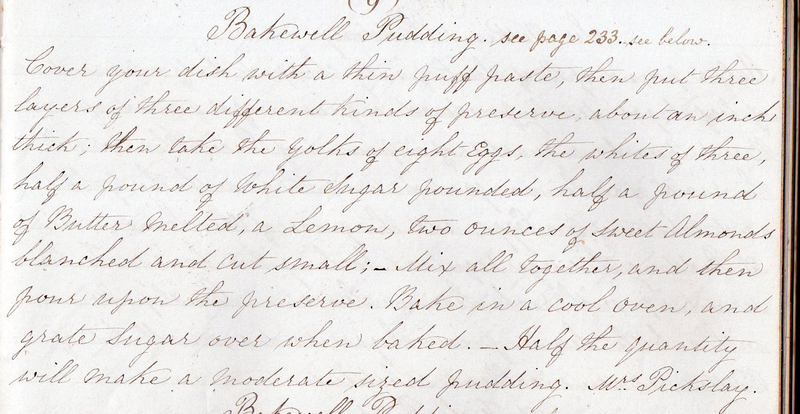 Looking at the 1814 Rundell recipe, it looks very close? Beat eight eggs very well; put them into a stew-pan with half a pound of sugar pounded fine, the same quantity of butter, and some nutmeg grated. Set it on the fire, and keep stirring it till it thickens. Then set it into a basin to cool; put a rich puff-paste round the edge of the dish pour in your pudding, and bake it in a moderate oven. It will cut light and clean. You may add candied orange and citron if you like." Adam. Sorry to fend off another of your questions by saying I will post an article about this issue. But I will. So look out for a future one entitled 'Return to Bakewell', which will deal with the taxonomy of the genus of puddings of which the Bakewell is a mere species. And of course the emergence of the Bakewell Tart. Yes. Transparent pudding - there are a number of 18th century English recipes, as well as Rundell's - was a member of this large and interesting genus. So were the baked Marrow Puddings mentioned by the editor of the later editions of Meg Dods, Sweetmeat Puddings and even the Tort du Moy. Tarts or baked puddings with a custard enriched with marrow fat or butter of course go back much further than the early modern period. 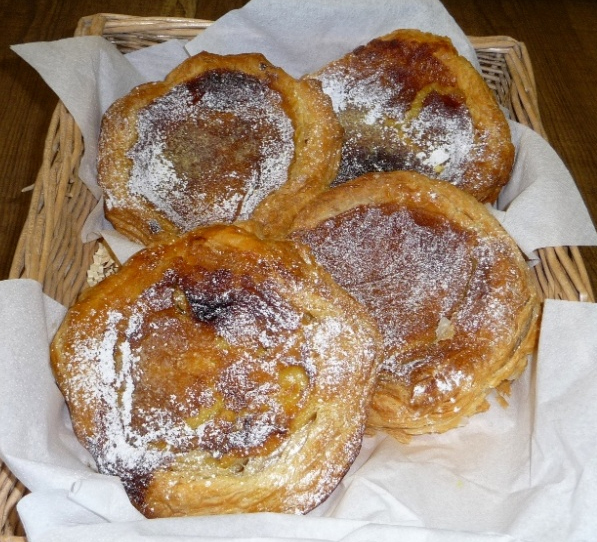 Some authors like Moira Buxton have argued that the original antecedent of the Bakewell are early baked goods such as flathons and dowsetts (PPC 5). But I think she overstates a rather poorly argued case, though these dishes were undoubtedly the forerunners of butter enriched custard filled puddings which reached their apogee in the eighteenth century. I do not want to say too much here, but the closest to the Bakewell Pudding is definitely E. Smith's Sweetmeat Pudding published in The Compleat Housewife (London 1727). More very soon!! Do you have a Facebook page? Absolutely love your blog, and will post a link to my Facebook page so I can share your wonderful culinary history with foodie friends. I have a recipe from a thin handwritten book, I will bring it when I see you at your course on saturday. It is not dated but later in the book I can find dates for 1870 and 1872 so the recipe might be earlier, though probably not earlier as the ones you have. It uses jam, lemon peel and juice, loaf sugar, butter, egg yolks, breadcrumb, puff paste and egg white spread over it at the end. Fascinating read as always Ivan. I can not wait to meet you. This was a great article, which I enjoyed reading, thank you. 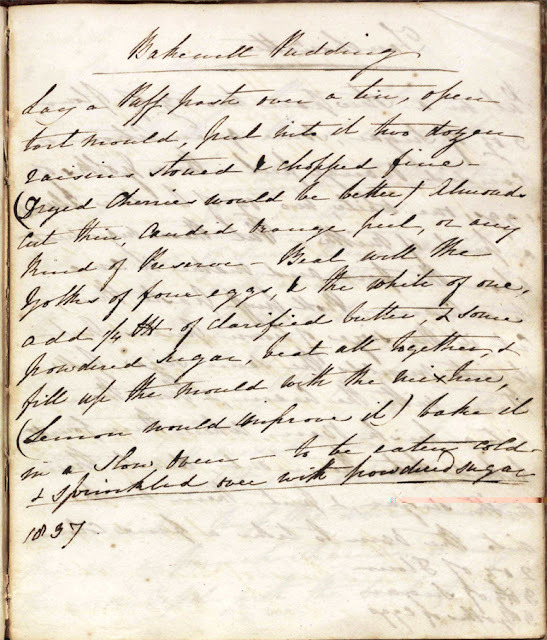 However I personally struggled reading the handwritten recipes, if you ever revisit it might it be possible to give us a transcript of the handwriting? Thanks.